Join the Kent Democratic Committee for a Daylight Savings Brunch on Sunday March 10th from 11am-1pm at the home of Michele Berdy & Drew Howland. Come meet neighbors, friends and future Kent candidates. The suggested contribution is $35 a person or $60 a couple, but gifts of any amount to the Kent Democratic Committee are appreciated. Please join us to meet Karen Strain Smythe, Candidate for New York State Senate, 41st District. Karen understands firsthand that Hudson Valley families deserve someone in Albany who will fight for economic development support, increased school aid, tax relief, real support for women and greater protections for our natural resources. Winning this seat is crucial for the Hudson Valley and the work that needs to be accomplished in the State Senate. Karen ran her family's union construction business and currently works as an executive at a local nonprofit. She has served on numerous Hudson Valley boards, including Vassar College, where she is currently a trustee. Karen was born and raised in Poughkeepsie and raised her family here. 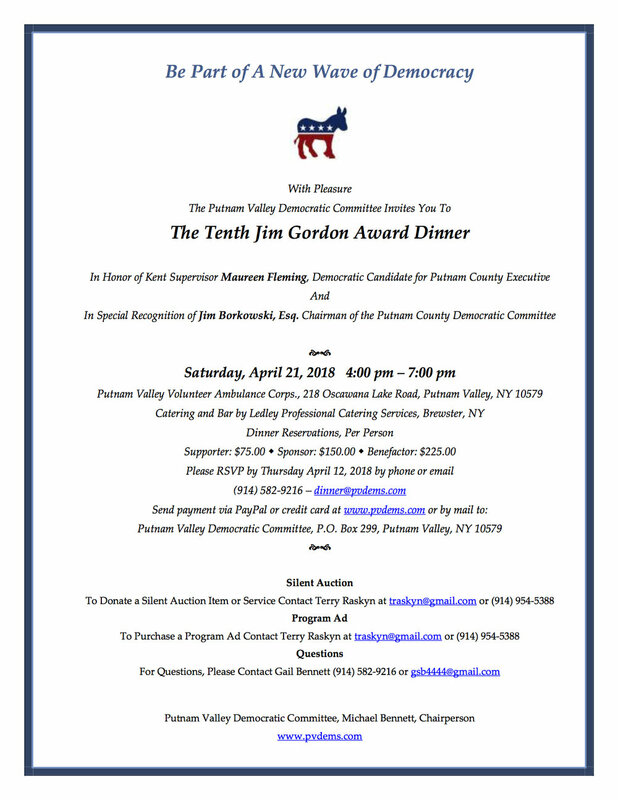 She is running to represent the 41st State Senate District, which encompasses most of Dutchess County and half of Putnam County. CO-HOST: Nancy Montgomery, candidate for Putnam County Legislature District 1. No cash contributions are permitted, check/credit card only. Please make checks payable to Friends of Karen S. Smythe, PO Box 2797, Poughkeepsie, NY 12603 or make a contribution online at bit.ly/SmytheJune24. If you can't attend but want to help, please consider making a donation at the link above. Up2Us presents a conversation with New York State Comptroller Thomas P. DiNapoli on Sunday, April 15th at New Castle Town Hall. Join Putnam Valley Town Justice Gina Capone, Putnam County DA Robert Tendy and Putnam Valley High School Student Support Specialists for a panel discussion on the opioid epidemic in our community. This event is in partnership with Drug Crisis in Our Backyard, a Carmel-based non-profit organization dedicated to supporting individuals and families struggling with addiction. explain the legislative process and discuss ways to get involved.